Iran on Monday launched its first space research unit in presence of President Mahmoud Ahmadinejad. The president said the launch of the first space research unit would be great stride to serve the mankind and would lead to Iran's exaltation and progress. He inaugurated Iran's first space terminal this morning. The country's first space terminal comprises of Omid satellite, Iran's first homemade developed research satellite which has been designed and constructed by the Iranian experts. The Omid satellite will be launched in the near future. Iran's space terminal has been designed to send the Islamic Republic's first homemade research satellite into orbit in the near future. During the ceremony, President Ahmadinejad inspected different sections of the terminal. The ceremony was attended by several ministers and a number of senior officials. Iran's first space terminal was inaugurated here on Monday in presence of President Mahmoud Ahmadinejad. The ceremony was attended by several ministers and a number of senior official. Russion sources sugessted launch of Omid (Hope) satellite in next iranian year, so March, 22nd, at earliest. IRINN TV showing repeated footage of the launch and are calling it a sounding rocket. Are we talking about this rocket? Or the second one? This rocket has 'Safir IRILV' written on it. IRILV presumably stands for 'Islamic Republic of Iran Launch Vehicle'. 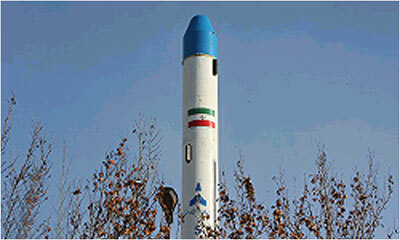 News reports from Iran also say that 'Iran launched a space research unit on Feb 4'. This is being interpreted to mean that a sounding rocket was launched, and there was video of a rocket launch (although it could be 'here's some video of last year's launch', since the translations are fairly poor). Other reports (from Western news agencies) say that Iran is calling the launch 'Kavoshgar-1' (Researcher, or Explorer). So is it Kavoshgar, or Safir? Is Kavoshgar the mission and Safir the rocket type, or is Kavoshgar the suborbital rocket and Safir the orbital version? A report from S Africa says the launch site was reported by Iranian media to be in Semnan province. I have seen in EuroNews a follow on to the video kindly posted by Satori in the Video section, and it shows the launch pad after the rocket has faded from view... there seems to be a parachute of some kind drifting over the pad, amid the dust clouds produced by the launch. What could this be? There doesn't seem to be any separation event from the rocket, and something falling from high above would drift away from the pad... what could it be? According to http://www.debka.com/headline.php?hid=5000 the rocket used was a Shahab-3. "The first Iranian rocket Explorer-1 was fired into space"
What about the launch last year? Last year's launch was also a Shahab-3 MRBM flown as a test of some kind related to a satellite program. Both launches so far appear to have largely been minimally modified MRBMs, similar to what ABMA did with "Jupiter A" tests prior to creating "Jupiter C". IMO, Iran is doing the same thing that the US and USSR did during the late 1950s. That is, they are adapting an existing missile system for use as a satellite launch vehicle, for both reasons of prestige and as a way to "demonstrate" their missile capabilities. (Think about how much more worldwide press Iran got for this launch today than it would have for a standard Shahab-3 missile test flight.) It does not appear right now that this effort will yield a practical launch vehicle able to carry useful payloads, but rather it looks more like a "capability demonstration" effort. The "capability" being "demonstrated" is sobering. An orbital capability is essentially an ICBM capability. "DEBKAfile" has a different take on this event. They describe "military sources" reporting that "Safir-1" was launched atop "an improved Shahab-3 which has a 4,000 km range." There is very interesting article on the link. Are we sure that Omid really reached the orbit? Did any "Satellite Spotter" managed to track the satellite? Has anybody received the transmission signals of Omid? Or this is another propaganda? osiossim - 6/2/2008 1:29 PM http://www.nature.com/news/2008/080205/full/news.2008.556.html There is very interesting article on the link. Are we sure that Omid really reached the orbit? Did any "Satellite Spotter" managed to track the satellite? Has anybody received the transmission signals of Omid? Or this is another propaganda? The article summarizes well what's known about this launch, but you misunderstood some important things: Omid will be launched in the near future (some sources aim for a March 2009 launch), so nothing reached orbit here, nor have the Iranians claimed such an easily verifiable fact. This rocket, as the article states, and has been known since the launch, is just a single stage missile that lacks by far the ability to reach orbit. It can travel up to 600 km vertically, so it's capable of reaching space, but it'd fall back down like a stone. Terming this as a space launch is something of propaganda, sure, because for people who aren't really into this topics "space" equals "orbital". But that's way far from truth, and the capability to stay in orbit still is a long way ahead for the Iranians. As it's been stated many times, if you have an orbital rocket, you have an ICBM, and they don't. The Nature article is good, but it doesn't really pose the "right" questions about this launch. For example: Did the Iranians downlink telemetry successfully? Did they track the flight e.g. by ground radar? Was there successful thrust-vectoring or other means of closed-loop guidance? Was there something like a payload seperation event at apogee or an attempted "stage" seperation after MECO? Many of these would be signs the launch was part of a spaceflight program, rather than "just" a ballistic missile program. Also of interest from a different perspective: What launch data were collected by e.g. the U.S. Defense Support Program "Satellite Early Warning System" satellites? 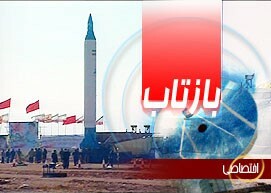 Iranian President stated that Kavoshgar-1 is 3 stage rocket !!! TEHRAN, Iran (AP) - Iran's recently launched research rocket has successfully transmitted scientific data back to the country, state television reported Sunday. The launch earlier this month provoked unease abroad because the same technology used to construct rockets can also be used to deliver warheads. Iran insists its space program is peaceful and is working toward the launch of the country's first domestically built satellite this summer. "Iran will launch its first satellite into a 650-kilometer (400-mile) orbit in June,'' Mirshams was quoted as saying. He said the satellite would pass over Iran five or six times in 24 hours. Iran says it wants to put its own satellites into orbit to monitor natural disasters in the earthquake-prone nation and improve telecommunications. Iranian officials also point to America's use of satellites to monitor Afghanistan and Iraq and say they need similar abilities for their security. Iran hopes to launch four more satellites by 2010, the government has said, to increase the number of land and mobile telephone lines to 80 million from 22 million. It also hopes to expand its satellite capabilities to increase Internet users to 35 million from 5.5 million. You´re right, but this article is interesting with information about planed launch Iranian satellite in June 2008. "The first rocket that was launched had three parts. It was a success," he said in the speech marking the 29th anniversary of the Islamic revolution. He said the first section of the rocket detached after 90 seconds and returned to earth with the help of a parachute while the second entered the earth's atmosphere after 300 seconds. "The third section of the rocket, which contained the probe, was sent towards orbit." "The probe is sending information on wind, temperature, pressure to allow the sending of new probes into space," he added. I think it's clear, they launched a sub-orbital flight with a system that relayed data on various parameters so that they could send another future flight into orbit. In any case, if anything reached orbit here, it is being tracked by radars around the world an can be verified. Anyone thought of asking the US Air Force about the position of said little satellite ? They have plenty of specialized satellites designed specifically to detect the launch of such missiles and this one was certainly tracked from space since the moment of its launch. I remember that when the Chinese showed the first pictures of the J-10 Chengdu fighter (and even years later and many more pictures after the first releases, people kept trying to pretend this must only be a mock-up... Same thing happened with the Chinese space launcher, as if other countries could not design a space launcher (N.Korea made a 3 stage launcher with what little money and resources they had, so Iran which is a major oil producer ? Easy for them, especially with a little technical help from Russia. They Iranians are very thorough in what they do, as we have seen in their nuclear program. About the Shenzou, one should not forget that the Shenzou is basically a military reconnaissance spacecraft. The Chinese and the US also started their space program out of ballistic missile programs. The Mercury manned first attempts were nothing more than sub-orbital flights flown from atop a ballistic missile for reasons of national prestige in response to the Soviet Union's launch of the first man into orbit. We are only seeing a repetition of history here, only between Israel and Iran this time, trying to best one another by showing the toys they have and what they can do with them. "Iran says its space probe sending data to earth"
"eeergo", are you still sure that Omid will send to space next year? If yes, what are they talking about now?